Afghanistan's first runs in Test cricket came off a four in the third ball they faced. Mohammad Shahzad, facing up to Umesh Yadav, didn't drive the ball as he'd have liked, but it pierced gully and backward point to the boundary all the same. Shahzad would strike two more streaky boundaries, making 14 of his team’s first 15 runs. But just two sessions later, they had crumbled to defeat in their maiden Test, by an innings and 262 runs. 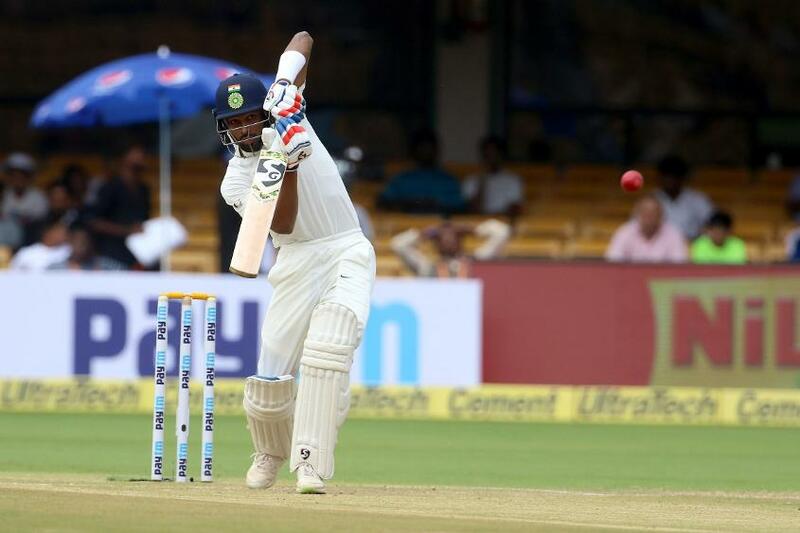 Having posted 474 runs, a dominant India first bowled out the Test debutants within a session for 109 in 27.5 overs. Then, they did it again, seeing them off for 103 in 38.4 overs to wrap up the one-off Test at 5.23pm on Friday, 15 June – the match at M Chinnaswamy Stadium in Bengaluru lasting less than two days. The new-ball pair of Ishant Sharma and Yadav made early inroads, before Ravichandran Ashwin picked up four wickets in Afghanistan’s first hit. The batsmen came out with fewer nerves after tea, but still had no answers to the Indians’ attack. Once Yadav and Sharma ran through their top order again, Ravindra Jadeja’s quickish spinners were the main threat as the No.1 Test side pulled no punches in welcoming the newest Test nation to the format. Starting the downfall once Afghanistan took guard after lunch was Hardik Pandya’s razor sharp throw from point to the non-striker’s end, which caught Shahzad short while going for a quick single. Javed Ahmadi, and a little later Afsar Zazai, had their middle stumps uprooted by full-length deliveries from Sharma that swung in. Between those, Yadav trapped Rahmat Shah plumb in front for his 100th Test wicket. Ashwin, introduced in the 13th over, needed just three balls to strike. Getting considerable turn of the kind Afghanistan couldn’t, he shook Asghar Stanikzai’s stumps. Hashmatullah Shahidi stood his ground for 23 balls, offering his bat in resolute defence, giving himself room and slashing, and reviewing an lbw decision successfully. Mohammad Nabi lasted 44 deliveries, top scoring with 24, having decided it was wiser to attack before he ran out of partners. Ashwin, though, sent them both back, and it was only Mujeeb Ur Rahman’s string of six, four, four in a nine-ball 16 that took their total into three figures. When the openers returned, they showed early signs of more patience, but slipped to old habits and poor footwork. Umesh, keeping it straight and quick, was rewarded in a first spell of 4-1-14-3. Shahzad stood rooted while much too casually edging behind for less than his first-innings score, and Ahmadi too nicked behind, while Nabi, promoted to No.4, was undone by a sharp review for lbw. Stanikzai and Shahidi rebuilt from 24/4. They held off the Indians for a little over an hour, adding 37 before the captain succumbed to a moment of impatience to make it 61/5. That again opened the floodgates. Jadeja’s delivery to get Zazai out, a beautiful delivery from around the wicket that beat the batsman to disturb his stumps, underlined the difference between the sides. He'd finish with 4/17. Shahidi was the best performer across both innings, adding 36* in the second to his 11 in the first. It was only the fourth occasion where a team was dismissed twice in the same day. In the morning, India, resuming on 345/6, made Afghanistan pay for lapses in the field. In Rashid Khan's third over of the day, short leg was late in going for a catch off Ashwin. Yamin Ahmadzai was denied a chance to take two in two when Jadeja was dropped first ball. Overthrows and edges raced to the boundary, and the captain was left ruefully shaking his head. Ashwin, having seen off some 'how-did-that-miss' balls from Khan, went on to add 35 in a seventh-wicket partnership with Pandya, before Jadeja combined with the young all-rounder for 67. Pandya, who was confidently pulling the pacers and striding forward to take the spinners at the turn, brought up a stellar fifty off 83 balls with a fiercely struck sweep. He had 10 fours in his 71, before handing the keeper a catch off a half-hearted ramp shot off Wafadar. Yadav swung his bat in a last-wicket stand of 34, which meant the last four wickets propped up the total by 140. At the end of the day, in keeping with the spirit in which the match was played, there were hugs between the teams. The Afghans, who had come to the ground in the morning in their traditional outfits to mark Eid-ul-Fitr, perhaps would do well to remember one fact from history as they embark on their Test journey: Back in 1952, India were dismissed twice on the third day of the Old Trafford Test against Len Hutton’s England. Even the No.1 Test side had to start somewhere.